from Carrie Bloomston of SUCH Designs! We are sure you all remember the popularity of Carrie's first collection with us, Collage. Well, she has done it again! With, PAINT, Carrie has created a collection that celebrates creativity and expression. As a creativity enabler, Carrie intends to help creative people "Celebrate your inner artist™"! The collection includes bold, playful novelties inspired by a painter’s tools. 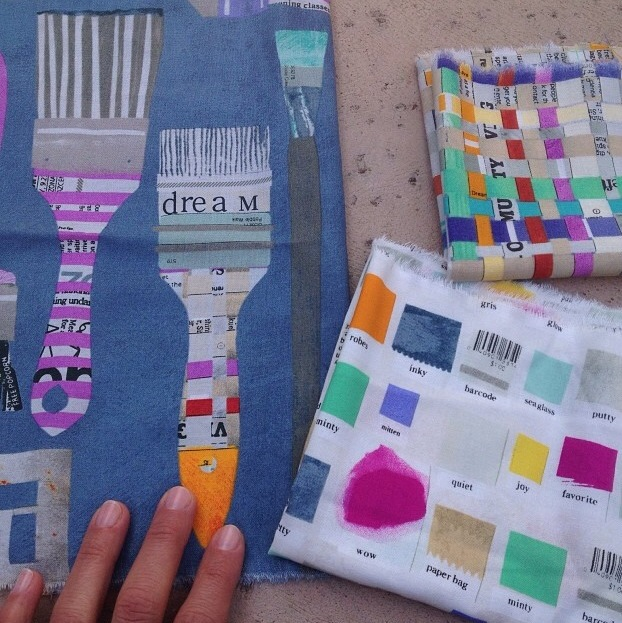 Color wheels, paint swatches, paint brushes and other collaged images create an artful pastiche of sewing possibility. Carrie loves to make something from nothing. She showcases up-cycling and recycling by creating her imagery from brown paper bags, paint swatches and colorful newsprint. PAINT tells the truly inspiring story of stepping into a creative life. Additionally, we are pleased to rerelease her wildly popular Newsprint in three color ways. If you are a wholesale customer, please contact your local sales rep or go to Windham Fabrics website to place orders beginning April 1st.